We are aware that there is a long standing belief within the balloon industry that balloons are 100% biodegradable and environmentally friendly. This belief appears to have come about because of a study commissioned by the US balloon industry in the 1980s and carried out by a twenty year employee of the rubber industry named D.K. Burchette. We would like to invite you to read through the information below that provides links to research demonstrating that latex balloons are unfortunately not known to be 100% biodegradable in all environments and pose a serious threat to marine wildlife. In particular we would like to point out that Burchette’s study did not examine what happens to latex balloons in salt water which is the primary focus of our documentary. Our documentary team has looked at all available studies on latex balloon degradation in salt water that we were able to find. Each one showed that the rate of degradation of latex balloons is greatly reduced in the marine environment. The available research shows that after one year at sea, balloons, unless consumed by an animal, will still be intact and recognisable as balloons. If they do ever fully break down (which we cannot know because no studies have run long enough to witness a balloon’s full degradation in the ocean), the total length of time required is therefore in excess of 12 months which is not helpful to animals that may mistake the balloon for prey over that one year period. The University of Queensland attempted to determine degradation rate of latex balloons but were unable to because the balloon pieces used did not degrade at all over the course of their three month experiment. Marketing latex balloons as “100% biodegradable and environmentally friendly” (as we have often read on balloon websites and on flyers created by the balloon industry) is misleading and likely causes some consumers to be careless in the disposal of latex balloons. Further we have seen on some balloon store websites a recommendation that people dispose of their balloons by using them as garden mulch, which may further encourage people to not ‘pin it and bin it’. We are, however, encouraged by the many balloon suppliers and balloon organisations that do not support the intentional release of balloons and would love to work in partnership with these groups and individuals to put a stop to balloon release ceremonies and re-educate the public about the reality of latex balloon degradation. Continue reading for more information about latex balloon degradation in salt water, including links to and excerpts from the studies. We have also addressed some of the other mythologies that appear to exist in the balloon industry – the idea that balloons are not ingested by wildlife, the idea that balloons are not found during beach cleanups, and the idea that when balloons burst high in the earth’s atmosphere, they burst into dozens of small shreds that each fall very far apart. Download a PDF (457kb) version of this article for offline reading. Though Burchette’s study did not examine what happens to latex balloons in salt water, it did examine the degradation of a latex balloon in creek water, and found that after six weeks the balloon had only lost 5.24% of its mass. Since then, other researchers have had even poorer results when conducting similar experiments (including Diede Melson’s work out of the University of Queensland as described below). However, if one is to accept his calculation as accurate where a latex balloon will loose 5.25% of its mass in six weeks, this is troubling. Balloons, as opposed to oak leafs, which Burchette used as a comparison, have a distinct likeness in shape and in many cases, colour, to jellyfish and squid – common prey items to many marine species including all six endangered sea turtle species. Page 6 of the scientific paper ‘To Eat or Not to Eat’ published in 2012 from the University of Queensland explains that all sea turtle species have been documented to eat jellyfish, though it is not the preferred food source for all species. We will explain the phenomenon of balloons bursting into jellyfish shapes in more detail soon. Balloons in water bodies are therefore more of a threat to marine species than are oak leafs, not only because of the way they are processed in animal bodies (more on this soon as well) but also because they look far more like common prey species than do floating leaves. The following scientific studies have taken place that have have looked at latex degradation in salt water environments. by Anthony L. Andrady, Ph.D. for the U.S. based National Marine Fisheries Service, U.S. Department of Commerce. 1988. Within this study balloon samples were immersed in salt water within a large fiberglass reinforced plastic tank placed at the beach. Sea water was continuously circulated through the tank to maintain about 12-18 inches height of fresh sea water at all times in the tank. The tank was of sufficiently large area to accommodate the full set of floating samples and the flow of water was rapid enough to ensure that the water temperature in the tank was the same as that of the sea even under hot summer conditions. Observations of balloons were made every two months. At the end of the 12 month trial, the latex balloons were still intact. Within this study, latex balloons were affixed with staples to a wooden platform and exposed horizontally on the flat roof of a laboratory building. Another set of examples was exposed floating in a tank of sea water, with fresh sea water continuously flowing through the tank to maintain a depth of about 12-18 inches of water at all times . The experiments were carried out for a period of one year. They found that for the rooftop balloons which were exposed to sun and air, the balloons lost 59% of their ultimate extension after only two months. After six months, the balloons had lost 94% of their ultimate extension and were too brittle/weak to be tested further. After two months in sea water, however, the balloons lost only 11% of its ultimate extension. The balloons continued to retain their elasticity during exposure in sea water, with only a 48% loss after 12 months. Within this study, 120 latex balloons were tied to cinder blocks on a white tiled roof of a three story building and left in the sun for six hours. 25 10 inch balloons of the brand “Tilly” and 50 9 inch of the brand “Qualatex”. Qualatex is a brand which currently hosts the World Balloon Convention (WBC), the world’s largest gathering of balloon professionals and markets its balloons as “Recognised as The Very Best, Qualatex latex balloons are made in the USA and Canada from 100% natural, biodegradable latex with no added fillers”. We are unsure if the latex balloons Qualatex currently produces are made from the same formula/recipe as were the balloons used for this experiment, published in 1990. We enquired about this but did not receive a reply. We have not reached out to Tilly because there appears that there may be more than one balloon brand by this name. All balloons that had not burst at the end of the six hour period were were ruptured and slowly deflated. The balloons were then placed into a floating pen. The sides of the pen floated to keep the balloons inside but the open meshed net allowed water to flow freely through the pen. The pen was placed in Florida’s Bayboro Harbor and secured to a dock. The balloons floated in the water for four weeks and then sunk to the bottom. From month to month, the tensile strength of the latex was gradually reduced and it became more tacky. At five months, the last month sampled, the latex would begin to tear with only moderate stretching and was fairly tacky. By six months, tunicates overgrew the lines holding the balloons and the balloons were lost. In Melson’s study, latex balloons were immersed in fresh and salt water tanks, with flowing water. She also examined the degradation of latex balloons in sand and soil. She found that the balloons immersed in fresh water showed some physical degradation over a three month period but had actually increased in mass. We spoke with Diede in our documentary and she mentioned that she was very surprised to see that balloons actually increased in mass during her experiment. She has hoped to calculate how long it would take a balloon to break down in fresh or salt water but was unable to do so because the balloons actually increased in mass. She also notes on page 25 that while the balloons immersed in fresh water increased in mass over the three month period, they did show some visual degradation. The balloons immersed in salt water, by contrast, did not show any visual signs of degradation. Diede Melson was interviewed about this study in our documentary. A yellow rubber balloon would take 23.3 years to degrade if buried in soil. A blue rubber balloon would take 36.66 years to degrade if buried in soil or 30.78 years if buried in sand. A white yellow balloon would take 34.15 years to degrade if buried in soil or 24.21 years to degrade if buried in sand. In Foley’s 1990 study where latex balloons were also exposed to sun for 6 hours and then immersed in salt water for six months, the balloons floated in the water for four weeks and then sunk to the bottom. From month to month the strength of the latex was gradually reduced and the balloons became more tacky. After five months, the latex would begin to tear. By six months, study was ended prematurely after balloon samples were lost due to growth of tunicates in the tank. In Melson’s 2012 honour’s thesis at the University of Queensland, latex balloons that were immersed in fresh water for three months underwent some physical degradation but were still intact at the end of the three month period and had increased in mass. Latex balloons that were immersed in salt water for three months showed no physical degradation and had increased in mass only slightly. On the topic of balloons as biodegradable items, we have also heard from various balloon organisations and in the newsletter “Balloon News” that BASA (the Balloon Artists and Suppliers Association of Australasia Ltd) creates that balloons are not found during beach cleanups. 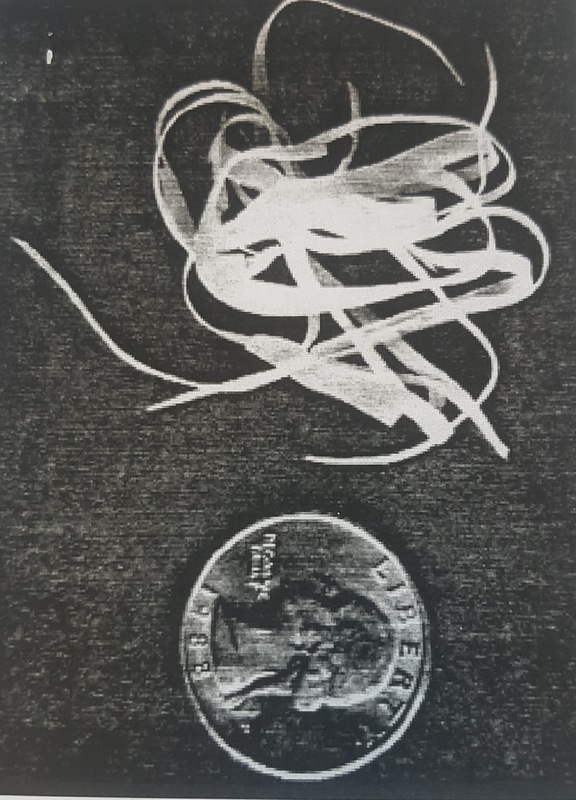 A study conducted in 1990 by the Florida Department of Natural Resources describes many balloons, including shredded balloons in the ‘Rubber Jellyfish’ shape that were found during beach cleanups along sea turtle habitats. The Australian organisation, Tangaroa Blue Foundation, which coordinates the Australian Marine Debris Initiative, – an on-ground national network of volunteers, communities, organisations and agencies that monitor the impacts of marine debris in Australia – also regularly find balloons, including latex balloons, during their beach cleanups. Between 2013 and 2016 they found over 22,500 whole and remnant latex balloons during their cleanup events with an average of five found at each cleanup event. They find a particularly large amount of balloons washed ashore along the Great Barrier Reef. Within our documentary we also met two volunteers from a Queensland-based turtle rescue organisation who conduct regular beach cleanups. They presented us with a collection of two grocery shopping bags that were over flowing with balloons, many in the jellyfish shape. They had all been collected over a four month period in 2016. The not-for-profit organisation Balloons Blow also conducts weekly beach cleanups in Florida, USA and finds balloons on a regular basis – hence why they were inspired to create their organisation. They have, in fact, found so many balloons over the years on Florida beaches that they have built a shed to house them. Those of us who have been involved in making this documentary also find littered balloons on a regular basis on beaches around Australia. The notion that balloons are not found during beach cleanups is simply untrue. We have very recently heard from an industrial composting company and another individual who has successfully composted latex balloons in her home composting equipment. Carly, the creator of our documentary, is also currently experimenting with composting a couple of latex balloons in her home compost bin, including two orange “Alpen” brand latex balloons that are advertised as 100% latex and biodegradable, and two yellow pieces of a burst latex balloon that was found on a street. At the current moment, the balloons have been in her compost bin for one month and have so far not changed in appearance, whatsoever. She will provide updates on what happens with these balloons on the Rubber Jellyfish Facebook page. We have spoken with other individuals who have had latex balloons in their own home compost bins for over a year and saw no degradation. Carly has also in the past experimented with burying a latex balloon for a period of one year and at the end of the year was still able to blow up the balloon. We are very interested in other examples of people who have attempted, successfully or not, to compost balloons. We want to point out, however, that though it will be encouraging to hear of additional accounts of balloons that have been successfully, fully, composted it is unlikely that a littered balloon would end up in a compost pile. Considering latex balloons have been found intact in marine environments for periods of up to a year or more and all streams and rivers lead to the sea, it is important that consumers do not feel that balloons can be littered or released into the atmosphere because they have been marketed as biodegradable and environmentally friendly. The study by Burchette makes the claim that “it seems extremely unlikely a turtle could forage a large enough area to find enough balloons to do harm” and that “it would be extremely far fetched to think that one of these small slivers of soft rubber could block the digestive tract of a sea turtle or dolphin”. By “soft slivers of soft rubber” the author is describing the thin shreds that balloons supposedly usually burst into when they rupture in the earth’s atmosphere. He does not acknowledge that when balloons rupture, the majority of the balloon often stays intact as a single piece. More about this in the next section. We have unfortunately seen Burchette’s direct quotes about balloons being highly unlikely to threaten the lives of sea animals on the websites of multiple balloon companies. There is sadly ample evidence that many animals will consume balloons and that balloon ingestion has caused fatalities in many species, including endangered sea turtle and sea bird species. Recently, for example, two latex balloons in the classic jellyfish shape were found inside of an deceased, endangered Grey Albatross in Australia. The bird had also ingested pieces of plastic. In our documentary we conduct several interviews with staff at Australian Seabird Rescue & Turtle Hospital in Ballina, NSW which has had numerous sea turtle and sea bird patients over the years found either deceased or suffering from “float syndrome” after consuming balloons. Float syndrome is a condition where gasses build up around the contents of an inedible item such as a balloon or piece of plastic that an animal has ingested. The gasses cause the animal to float and not be able to dive down to feed. Without treatment affected animals are susceptible to death by predation, boat strike, or starvation. The film discusses one such patient, a critically endangered Hawksbill Sea Turtle, that died after ingesting numerous balloons. There was no other foreign debris in the animal’s digestive system. The film also discusses a hatchling sea turtle that was found suffering from float syndrome and later passed away. The necropsy discovered that it had eaten a balloon and no other foreign material. According to Plotkin and Amos’s study from the University of Texas Marine Science Institute in 1989, as many as 6.3% of sea turtles die with balloon debris in their gastrointestinal tracts. More recently, a study out of the University of Queensland in 2012 found that sea turtles actively target balloons above and beyond other types of litter. Of their study of 115 sea turtles that were found deceased, 10 had ingested balloons. They found that young sea turtles were most likely to consume balloons. They also found a correlation between colour of balloon and likelihood of ingestion. 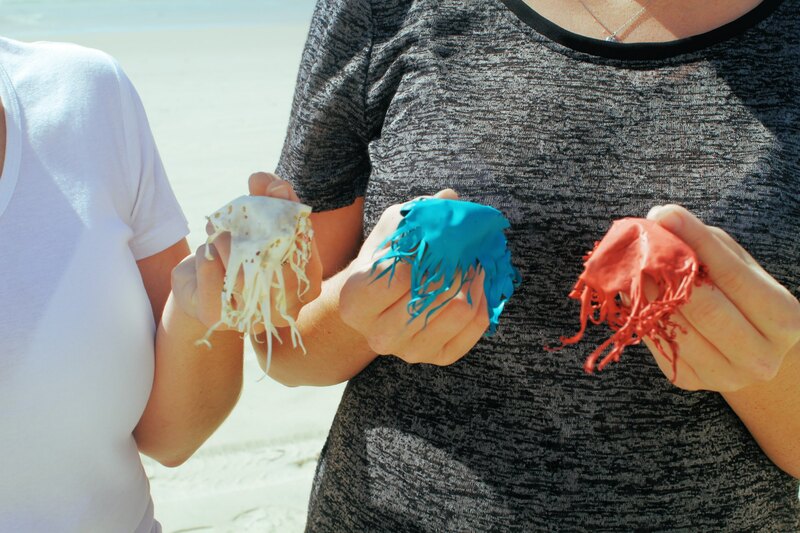 They have found that red, orange, and pink balloons are found more often in the stomach contents of deceased sea turtles and sea birds than other colours – possibly because these species also naturally consume squid of the same shape and colour. These findings are discussed in more detail by the leading researcher in our documentary. The not for profit organisation Balloons Blow also gives many photo examples of animals that have either consumed balloons or become entangled in their strings. Our film will also hi light some specific cases of animals that have died after consuming balloons. We are aware that the balloon industry generally does not condone the release of helium balloons with non biodegradable strings or plastic clips attached. Helium-filled balloons that were not intended for release, however, always have the potential to “escape”, particularly in the hands of a child. Burchette’s study claims that “the vast majority of released toy balloons will . . . rise to a height of several miles and blow apart into very small pieces which then float back to earth”. Upon reading through the study, it is unclear where the author got this idea. He did perform some laboratory tests where he inflated latex balloons to the bursting point. It does not appear, however, that he never conducted any studies of balloons that were released into the atmosphere or placed in any type of laboratory equipment to mimic the earth’s atmosphere. Further, he uses the photo above (please refer to the back and white photo of a balloon next to a coin) as his example of a balloon that has supposedly burst into “spaghetti like pieces” in the earth’s atmosphere. If you take a closer look at the photo, however, you will notice that the balloon is actually a fully intact single piece with a shredded, squid-like tail. 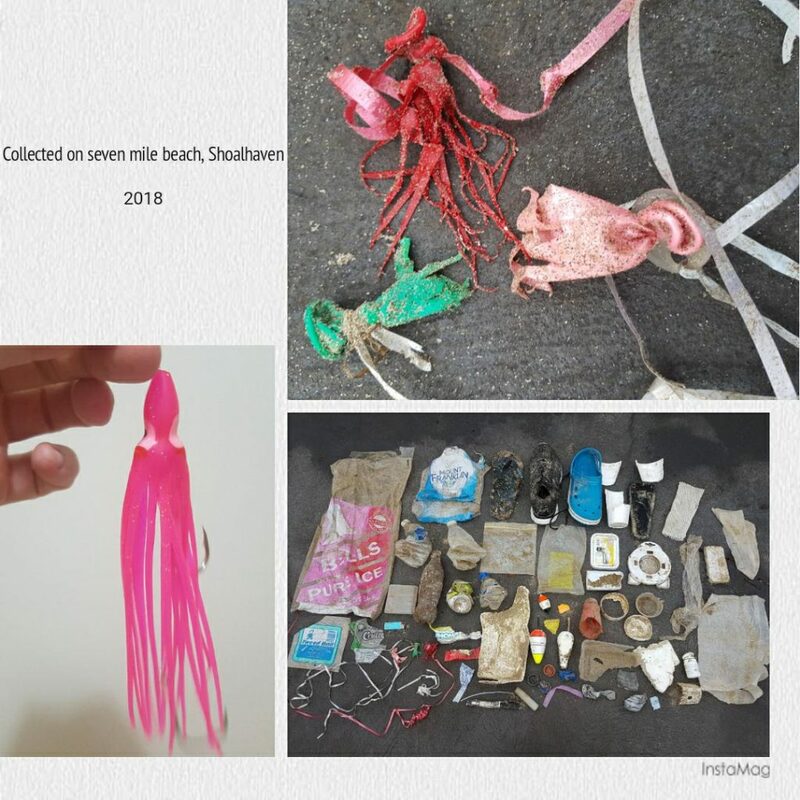 It has a similar appearance to these balloons (see photo collage) that were collected on Seven Mile Beach in Shoalhaven, NSW (Australia). We also included a photo of a common fishing lure in this collage for comparison. These fishing lures are designed in this squid-like shape because so many fish and other species consume squid. It is extremely concerning that latex balloons so often burst into the same shape. Balloons in the classic jellyfish/squid shape found during a beach cleanup. The photo to the left of the pink fishing lure is provided or comparison purposes. Photos courtesy of Caitlin Lymbery. Balloons have also been recorded to burst into squid or jellyfish like shapes in the University of Queensland’s study (mentioned above) into the consumption of balloons by sea turtles. Our film team has also, personally gathered a large collection of balloons that have been collected on beaches around Australia that have these characteristic shredded tails and in our documentary is a video of a weather balloon bursting at high altitude into the jellyfish shape. There have also been other studies to confirm that balloons will burst into these shapes. 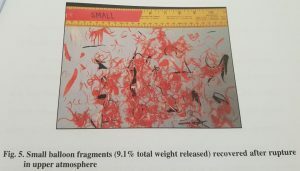 In this paper, the authors dispute Burchette’s claims that 95% of released balloons are reduced completely into “dozens of tiny pieces which float harmlessly back to earth. Within this study, 35 ‘Qualattex’ balloons were placed into a Northstar freeze-dry machine to mimic both the temperatures and pressure that balloons are exposed to at high altitude. Eleven of the balloons were completely reduced to unattached shreds and a neck, but seventeen, although partly or mostly shredded, remained intact (all or most parts still connected) and seven balloons burst without shredding. The simulator calculated that they burst at pressures corresponding to between 20,000 and 36,000 feet in the atmosphere. Balloons that burst under the simulated conditions of high altitude in the freeze—dry machine as well as samples of “natural” balloon debris collected in Florida demonstrate that many if not most of the balloons that burst at a high altitude, although partly or mostly shredded, remain intact. This paper is a PhD dissertation by a student at Clemson University in South Carolina, a university that releases balloons ceremonially at home football games. 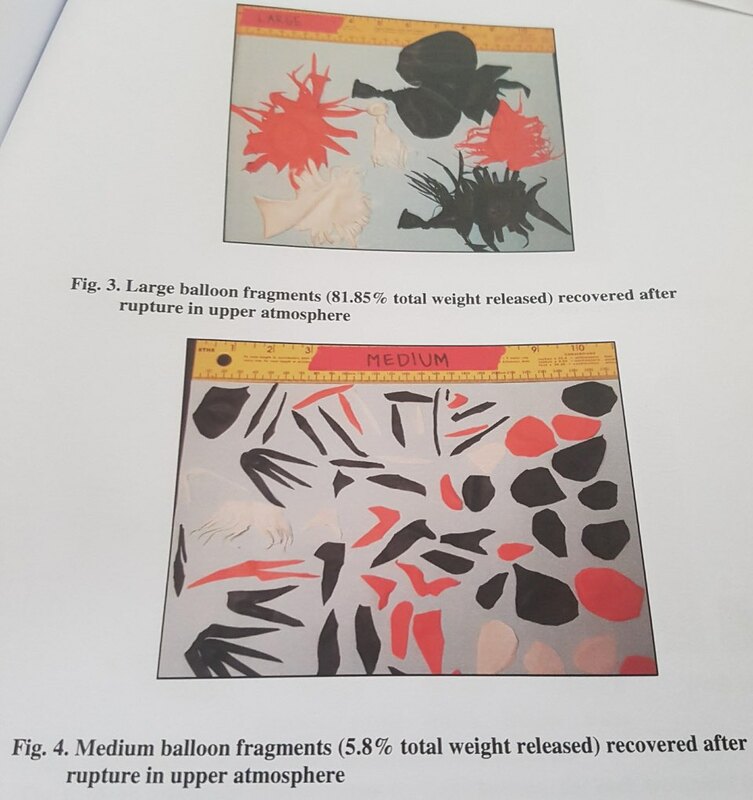 Latex balloons and balloon fragments from football games were recovered and measured (based on weight). 81.85% were large pieces in jellyfish shapes with at least half of the original balloon intact, 5.8%were medium sized fragments, and 9.1% were tiny shreds (see photos below) which were taken from page 31 of the report. Their report also found that fresh water turtles (they were not able to experiment on marine turtles for ethical reasons) will readily consume small pieces of latex which can then form clumps in the animals’ guts which may or may not be able to be passed through. Their animal experiments only lasted four weeks which is not sufficient time to examine the longer term effects of balloon ingestion on turtles, especially considering that sea turtles have very slow metabolisms. The study also did not examine the effects on turtles that consume larger pieces of latex such as the large jellyfish shaped balloon fragments that were recovered from one of their football game balloon release ceremonies. They only offered small pieces of latex to the animals of their study. Recovered balloons from one of Clemson University’s football game balloon release ceremonies. 81.85% of balloon fragments (based on weight) were at least 50% the size of the original balloon. 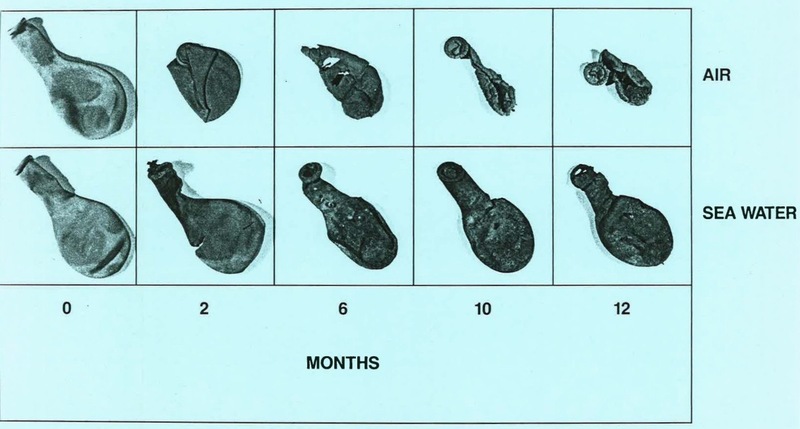 Small balloon fragments after repture in the atmosphere. Latex balloons can travel extremely long distances before bursting. In fact some appear to get sucked into wind currents below the ‘popping point’ and cross the planet without bursting at all. In the PhD dissertation mentioned earlier completed by a student at Clemson University it was also found that some balloons traveled as far as 451 kilometres from the release site. The author remarked that “the possible distance traveled established that balloon releases from Clemson University football games can reach the Atlantic Ocean”. It is notable that despite this finding, Clemson University continues to release thousands of orange balloons at their home football games. We hope that this information has provided extra information about latex balloon degradation and potential ingestion of balloons by wildlife. Feel free to contact Carly Wilson (who compiled this information) for clarification or through one of our social media channels.